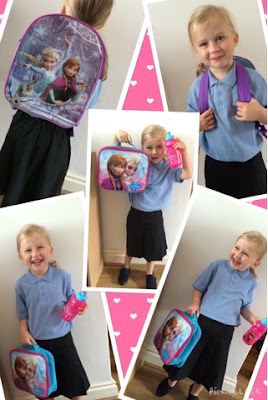 Life with Liv: Preparing to go back to school with Home Bargains. Preparing to go back to school with Home Bargains. 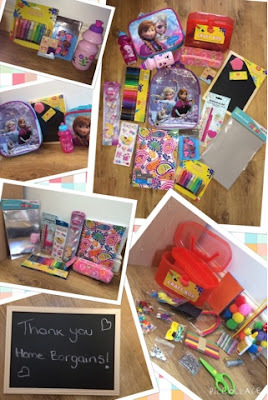 The A few weeks ago I received a surprise email from the lovely people at Home Bargains asking if they could send us some back to school goodies for Liv - Yes please I replied! I can't put into words how shocked I was when a few days later a huge box was delivered filled with tonnes of crafting supplies, stationary AND a school backpack, lunch bag and sports bottle - a truly lovely parcel to receive! 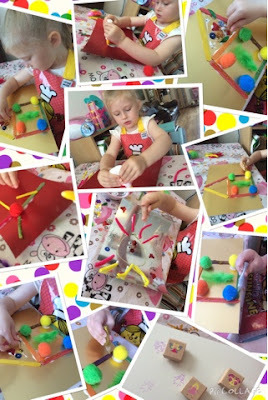 We have had great fun getting crafty with some of the items. Liv set to work last week making many lovely pieces of artwork. In the craft box alone she found, PVA glue, plastic scissors, glitter glue, glitter, sequins, wobbly 3D eyes, feathers, lolly pop sticks, pipe cleaners, pompoms, gems and more! LEFT - here she is proudly showing off her new backpack, lunch bag and drink bottle. RIGHT- here you can see her in action on various colours of the metallic card. We have had a great time with the products sent and will definitely be recommending other Parents get their Kids ready for back to school with Home Bargains!